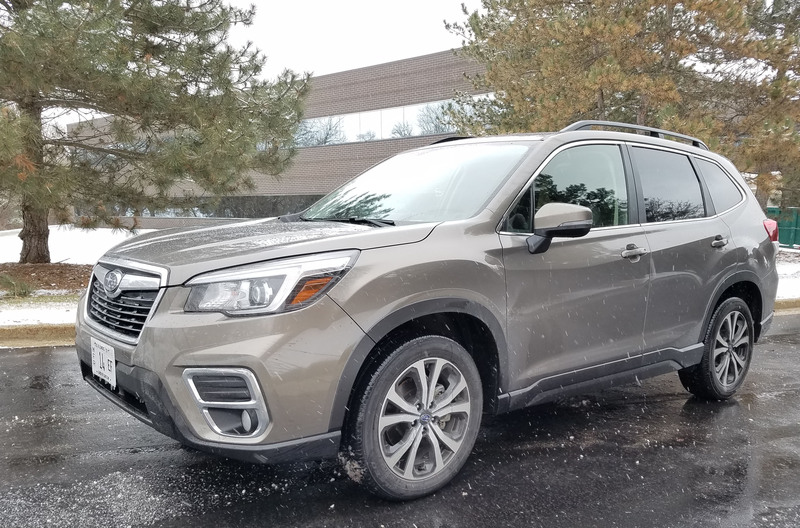 Subaru’s 2019 Forester solves that, plus moves Subaru into the automotive mainstream by offering a heated steering wheel. Bingo! The difference, primarily, is a lengthened wheelbase, now up to 105.1 inches. The longer a wheelbase, usually the better the ride, and it seems Subaru has found the best blend of length and spritely handling. I consider this the benchmark, now, for compact crossovers. Actually everything has been smoothed a bit for 2019, from the ride, to engine performance to exterior styling. 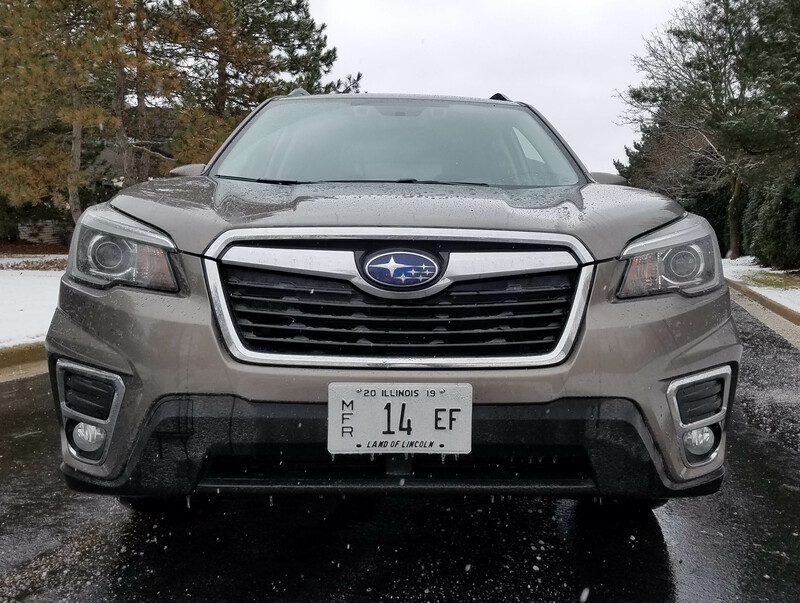 Subaru not only stretched the Forester, it bumped up horsepower 12 ponies to 182 from the tweaked 2.5-liter Boxer 4 which seems nearly perfectly linked to the crossover’s Lineartronic CVT. Continuously variable transmissions are mostly smooth, but in the last generation Forester the engine seemed a bit overstressed under heavy acceleration. Now, with a bit more power and the latest CVT there’s only slight engine moan. Acceleration is smoother with this combo. Handling, always a Forester strong point, remains so. Steering is light and the vehicle feels lively still. Yet there’s reasonable feedback through the steering wheel, not the spongy feel so many other utes’ and crossovers’ steering offers. Plus the vehicle’s tight turning radius makes the Forester easy to park and maneuver in tight spots. 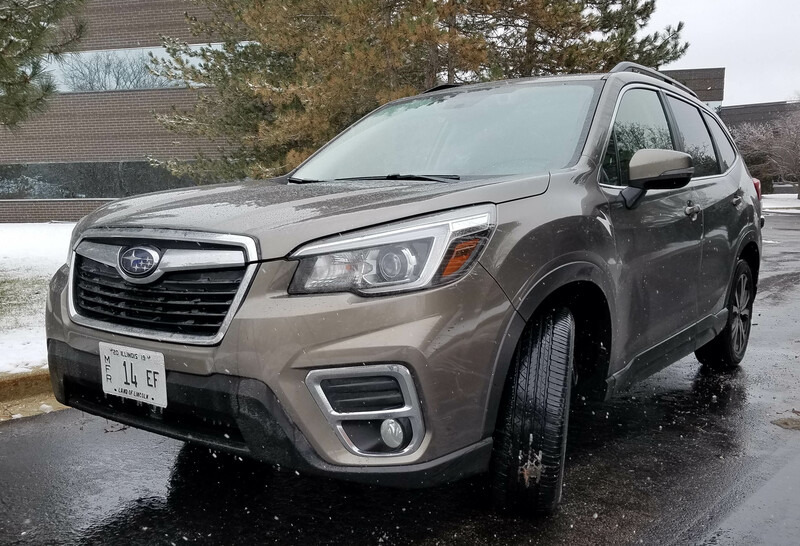 Also, with Subaru’s noted all-wheel-drive underneath the Forester, plus a torque vectoring system, the vehicle handles great in snow and slush, while exhibiting little body lean, no matter the weather. And if you’re an off-roader, or simply like to play in snow and mud, Forester features 8.7 inches of ground clearance. Subaru also updates its X-Mode system for improved driving in off-road and sloppy conditions. The dial on the console includes the Normal AWD mode, plus one for snow and dirt and another for deep snow and mud, each adjusting the power directed to the various drive wheels to help improve traction. But wait, there’s more … Subaru brings its fine EyeSight Driver Assist technology as standard to all Forester trim levels. Previously it was an option of more than $1000. The tested Limited model, one down from the line-topping Touring only saw a $475 price boost from the 2018 model. So it seems more value has been added. EyeSight includes sensors front and rear to help prevent collisions. It alerts you if a vehicle pulls out in front of your vehicle, a pedestrian or cyclist is endangered, and watches for vehicles suddenly braking or slowing dramatically. The full gamut of safety devices we’ve come to expect also are here, from blind-spot warning to lane departure, to rear cross-traffic alert, and a rearview camera. 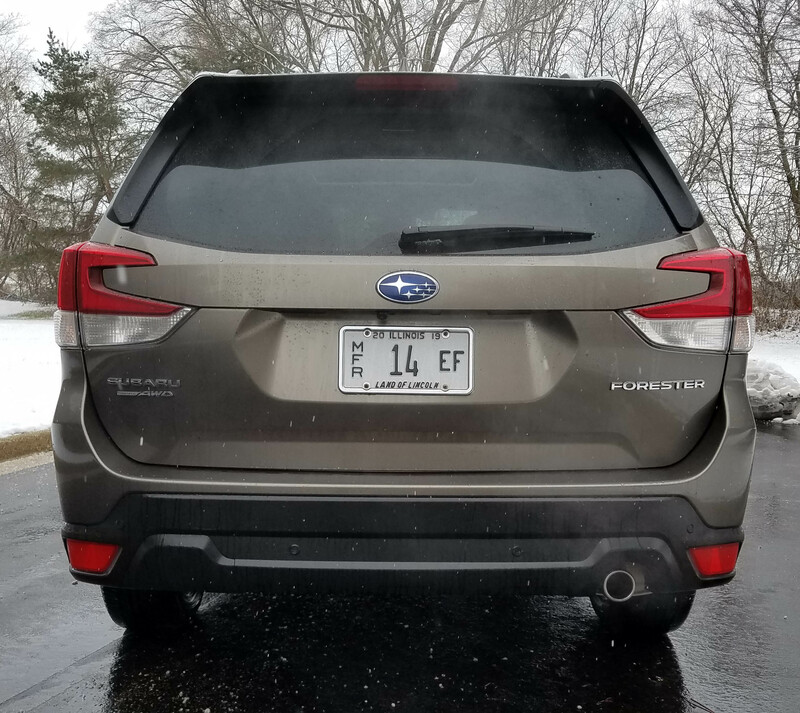 Forester’s exterior, while still offering a chiseled look to its nose, has a smoother profile to make it more appealing to a wider buyer market. Some thought the former Forester too boxy, this appears less so. On the inside, which includes a bit more rear seat legroom, the Forester’s layout and functionality are darn near perfect. The tested Sepia Bronze Metallic (metallic light bronzish brown) Limited featured a black dash with thin silver honeycomb trim and regular chrome finish on the door pulls, satin chrome around the console-mounted shifter, and gloss black trim on the center stack. The dash and black leather seats also include a light gray stitching to class up the interior. Seats are powered and mildly contoured up front with just enough back and hip support for a comfortable ride. You can adjust the power lumbar to help ease back strain too and head and legroom are generous front and rear. 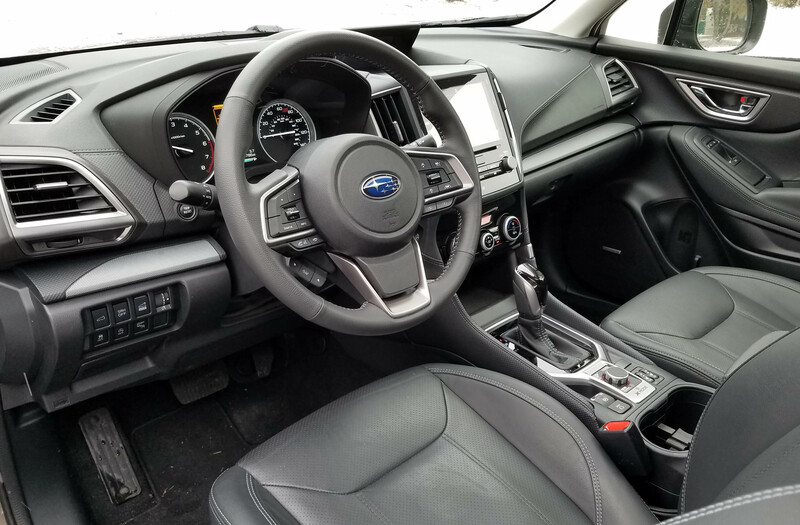 Front seats offer two-level heated cushions too, and wonder of wonder, Subaru finally offers a heated steering wheel, plus it warms quickly. Not sure why it took this outdoorsy-oriented car company so long, but thank goodness it has wised up and added the heated wheel that our climate demands. 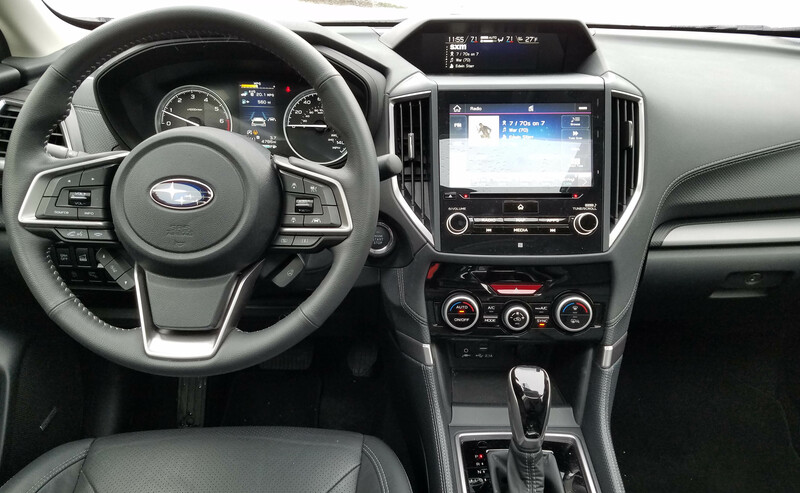 Dash gauges are easy to see and Subaru also features a fine infotainment system and touchscreen. This one is 8-inches (part of a package), but well worth it. It’s simple to operate with six memory buttons on the screen’s bottom for channel selections, plus more you can scroll to. Best yet, the buttons all work even when a driver is wearing gloves. Bravo! Hope some of the luxury makes take note and figure this out soon. This one is driver friendly! Another win, a $1,695 nav and radio package includes a Harman Kardon premium sound system with 576 watts of power and nine speakers, plus a simple-to-use TomTom nav system along with a CD player, Android Auto and Apple CarPlay, plus Bluetooth. Satellite radio also is included. Above that screen, amid the dash’s top, is a smaller second screen with a clock, indoor and outdoor temperature readings, plus a radio station readout. 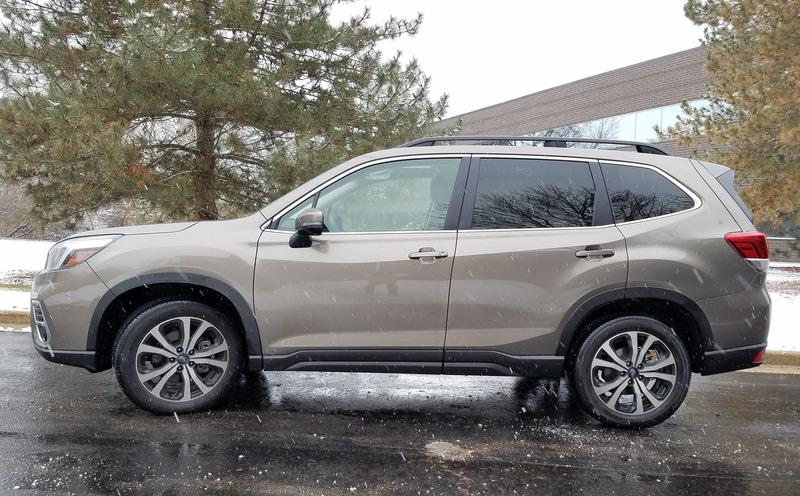 Climate controls are simple to use and include an automatic feature for both driver and passenger while overhead is a large extended sunroof that makes Forester attractive to folks wanting to let a lot of sun in while touring the hinter lands. Sun visors also have big extenders and overall visibility is excellent in the Forester, a rarity in most crossovers and SUVs. Back seats split and fold down easily and there’s substantial cargo room under the power rear hatch, a big rubber cargo mat on the cargo floor and the hatch includes a wiper. Up top there are roof rails, a benefit to campers and kayakers who may need to strap some cargo down. My only complaint is that the rearview mirror won’t adjust downward enough for short driver to have clear rear view. I found the mirror fine on my morning drives, but by evening I was shorter, or slouched, enough that I wanted to adjust the mirror downward a tad more. But it will not swivel that low. Haven’t had this problem on many vehicles, so hope a dealer may be able to fix that flaw. Gas mileage is fine for a compact ute with AWD. I got 25.9 miles per gallon while the EPA rates the Forester at 26 mpg city and 33 mpg highway. Forester is happy with regular unleaded. Like all crossover lineups, the Forester comes in a variety of trims. The base starts at $25,270 including delivery, and remember even this model has AWD and the EyeSight safety system. A Premium model starts at $27,670, and a Sport with some sportier exterior trim at $29,770. The tested Limited lists at $31,770, including delivery, while a top-end Touring model lists at $35,270. With options, the test crossover was $33,465, still well below the average new car cost these days. Compact sport-utes and crossovers now have a new leader to follow, the Subaru Forester, an excellent value in all trims. Hits: Smoother ride and better acceleration than past models, modestly improved styling, light and nimble handling. Excellent radio and infotainment screen, good climate controls, 2-level heated seats and heated steering wheel, plus big sunroof. Misses: Rearview mirror won’t adjust downward enough for short driver to have clear rear view. 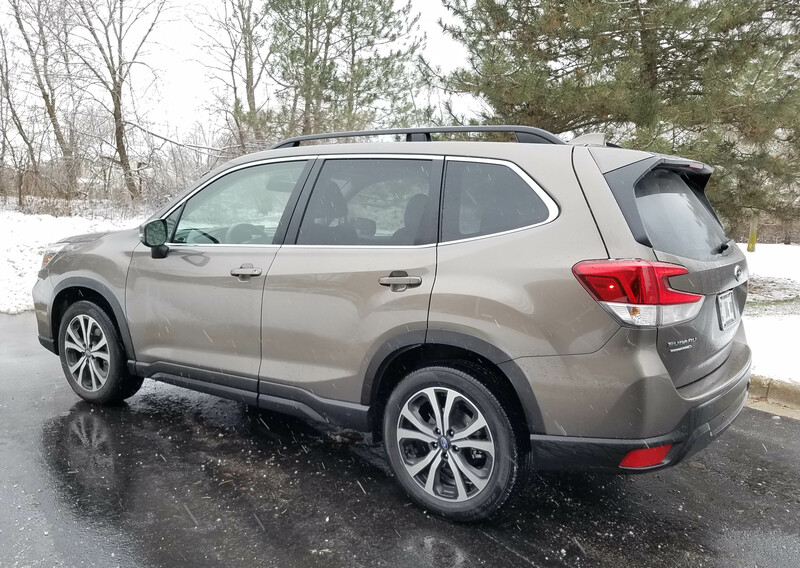 Enjoyed reading your Subaru 2019 Forester review. I am looking forward to upgrading my 2017 leased Forester for the 2020 model. I found in your review the remark regarding the heated steering wheel. You state: “wonder of wonder, Subaru finally offers a heated steering wheel.” This is not a first. I have a heated steering wheel in my 2017 Touring XL. Are both front seats now powered? So far all of my (7) Subaru’s have not had the passenger seat available in power. Keep up the great reviews. I really enjoy reading them. Carrie, I’m sorry, I don’t recall if the passenger’s seat was powered. And this was the first Forester I’ve driven in my many years that had a heated steering wheel. Glad if they offered it a year ago. We have a 2016 Outlander and it was not even an option then. Thanks for reading the reviews and hope they are helpful. I definitely would buy a Forester now that they have improved the ride and have the heated wheel! Take care!